All reports indicate there’s a heatwave on the cards! To help you make the most of the soaring temperatures, we’ve put together a guide to 5 of the best family friendly cafes, bars, pubs and restaurants in Macclesfield and the surrounding area. The ones we feature below are located in Macclesfield, Knutsford and Congleton but visit the Eating Out Section of the website for full listings of Family Friendly Eating Out in Macclesfield, Alderley Edge, Prestbury, Knutsford, Wilmslow, Poynton, Congleton, Sandbach and surrounding areas. 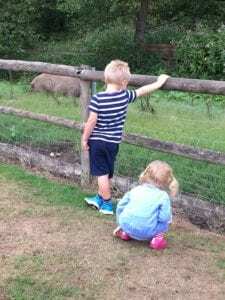 These places aren’t exclusively for families or children but they have all shown thoughtful touches or great facilities (things like pushchair access, changing facilities, highchairs, play areas and so on) that make them baby, toddler, child and family friendly. We spent a lovely couple of hours at this posh child friendly ice cream parlour in Knutsford. Located on a working dairy farm, the cafe serves delicious savouries including soup and quiche but, unsurprisingly given its name, the real star of the show is the ice cream. Choose from favourites such as strawberry or chocolate or try something new like their Vimto flavour ice cream! Eat indoors in the very well presented cafe which has an indoor play area/toy corner complete with play kitchen (grab the sofa next to it and enjoy your ice cream in peace whilst the little ones play) or make the most of the sunshine and head outside where you can let the kids run wild in the play barn, potter in the sandpit or tear round in one of the toy cars whilst you have a natter. Don’t forget to say hello to the dairy cows roaming round the fields. 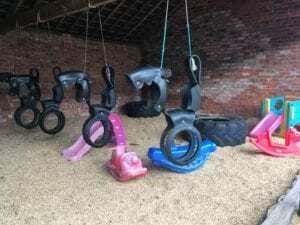 For more information on Seven Sisters Ice Cream Farm and other local child friendly ice cream parlours in Knutsford and over areas of East Cheshire see our listings here. The cafe at Glebe Farm in Congleton is a great shout for lunch with the kids – plenty of high chairs, a box of books to keep them entertained whilst you eat and enough room to navigate buggies make it a really good baby, toddler and child friendly option. There are plenty of tables outside to enjoy the mild weather and, of course, the mini mumblers can visit the animals whilst you’re there. They also have an outdoor play area which is pretty toddler friendly with a few Little Tykes toys and a static tractor for them to climb all over. The cafe apparently does a very good afternoon tea if you want to treat yourself. For more information on Glebe Farm and other local child friendly cafes see our listings here. If you fancy making the most of the sun with a visit to the farm check out our list of local farms under the Days Out section here. A firm Mumbler favourite! A lovely family friendly pub near Knutsford with a fantastic beer garden and great outdoor play area for the kids. A little animals corner is home to some pigs which never fail to delight my Mini Mumbler. There’s a dedicated Kids Menu and children’s meals are half price on Fridays. For more information on Railway Inn and other child friendly pubs as well as pubs with outdoor play areas in Knutsford and other areas of East Cheshire, see our listings here. The garden at Ruby’s Fund in Congleton is a delight. It has plenty of garden toys to go around including cars, a wriggly caterpillar to climb on and through, and a fab mud kitchen which my mini mumbler was fascinated by. Grown ups can relax on the outdoor seating and monitor proceedings while having a brew or a bite to eat from the family friendly cafe – sandwiches, panini’s and other staples such as beans on toast are sold alongside a selection of cakes, biscuits etc. If you do get a bit chilly, head inside where the kids can play in the soft play and Wendy House and use the dressing up clothes, toys and books. Young babies are catered for with sensory toys and jumperoos. There’s also a lovely, calm sensory room to relax and chill out in before heading home. For more information on Ruby’s Fund and other child and baby friendly cafes in Congleton and other areas of East Cheshire, see our listings here. 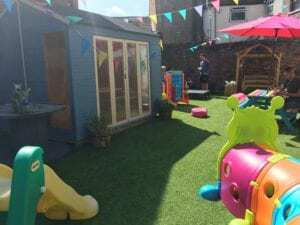 ‘Ideally situated’ according to parents, this baby and child friendly cafe in West Park Macclesfield overlooks the play area and is an ideal place to refuel after a vigorous play session. The cafe hosts regular eat fresco events throughout the summer so keep an eye on the Events Calendar to keep up to date. 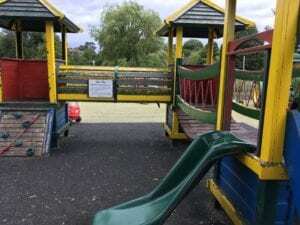 For more information on West Park cafe and other family friendly cafes in Macclesfield and other areas of East Cheshire, see our listings here. There’s also a list of local parks and playgrounds for kids to help you make the most of the sunshine.